Discussion in 'Art & Culture' started by cluelusshusbund, Mar 26, 2017. Reguardless of ther monetary value... who painted 'em or historical value... from the link above... pick the top 5 paintings you woud enjoy havin in you'r house.!!! Below are my picks but dont be influenced by that... choose what you like.!!! This particular one is monotone, so not very interesting to me. I like his more colourful ones though. I like this one, but I confess it's because of its appearance in Ferris Bueller's Day Off. I like the light on the edifices. I also like the more colorful ones.!!! I kinda get the sinsation that im bein pulled toward the background when i stare at it.!!! Very perty... but the sad/serous expressions keeps it from brangin joy to me.!!! I thank i like the original beter... lol... but have you counted how many creatures, an "human" faces are in your's.??? Mona Lisa and Girl with a pearl Earring - but since I've used up my five picks, I'll settle for just the old lady. plus he's over-represented with three pictures, while there is not a single Constable or O'Keefe. Anyway, what I admire in a gallery and what I can imagine living with, day after day, at close quarters, are quite different. Yep. Considering the related post, I think it was Clueless' intent to draw that line. Starting from the top, in the interest of full disclosure... I have a small version of this one hanging in my "man cave:"
Yes, go for it Clueless! Well sometimes peoples wishes is my command... so do it to it... post you'r own list or favorite art work.!!! I was gonna make a joke but i read the about the pic first... an OMG... thats one of the saddest thangs ive seen.!!! Its a horror in the art world but i coudnt help but LOL.!!! Yeah, that's what happens when you let your Aunt Martha, a not-very-famous paint-by-number artist, restore a priceless irreplaceable piece of art. Oystein -- Yeah, that's what happens when you let your Aunt Martha, a famous paint-by-number artist, restore a priceless irreplaceable piece of art. Maybe it wasn't priceless. Maybe it wasn't even very good. But it was the painter's own; it had a personality and integrity. any more than the Mona Lisa deserves to have animals painted all over it, or The Scream deserves to be on a mouse-pad. PS Randwolf, that's one of the more interesting Dalis. Once, in a whole different lifetime, while Dali was still hanging around - from helicopters, by the mustaches - I came this -- close to spending two months' salary on a 6x8" Dali print (#279 of a 750 run). Even after I sobered up, I visited it several more times until some richer fool took it home. Apparently, I still haven't quite stopped mourning. PPS - Gad! That building is almost as awful as the glass pyramid in front of the Louvre. When I was a puppy art student I was entirely enamoured with Dali, among others. 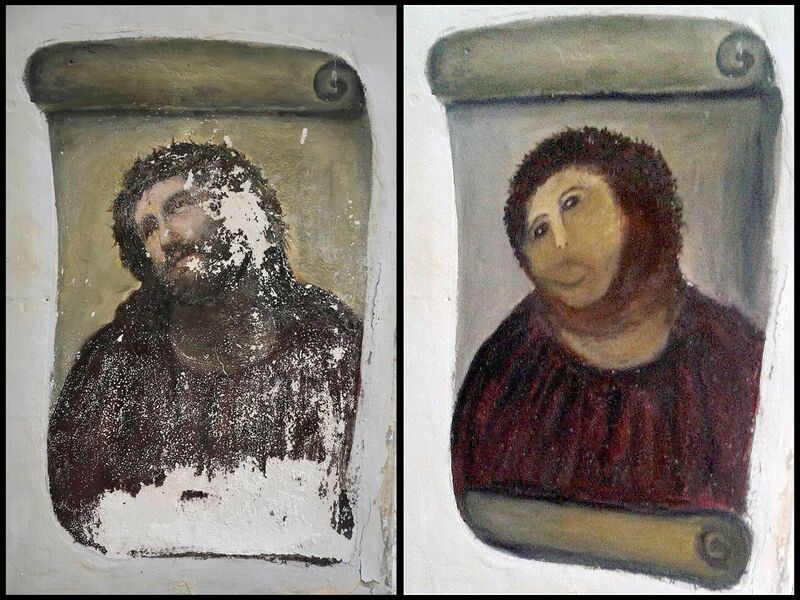 As I do some professional conservation, the damage done to the damaged Christ painting was a travesty indeed. Just because you are old doesn't give you the right to ruin others work. Whistler was wonderful, I have just reread "The Gentle Art of Making Enemies" again, am very fond of the quote "Any artist who states he is self taught had a fool for a master." I have far too many favourite paintings to even begin listing them...though I must admit that Rothko is not on that list. Then it won't be taken amiss if I leave Pollock off mine. The two I can most easily envisage enjoying on a daily basis at home would be the portrait of Mme Recamier, because my wife was French and we have quite a lot of French antique furniture in the house, so it would fit, and the Kandinsky Composition 8. The latter however would need a modern-looking room. Perhaps if I ever get my kitchen re-done it would look good in there. I admire plenty of the others, but do not think they would suitable to live with, in my own house. It was a fairly easy choice. There are a few also-rans but most of them I wouldn't want in my house. Do an internet search for "Jeremy Worst Jack Daniels"